The Yankees got just what they needed from J.A. Happ in his debut in The Bronx, since he was acquired from Toronto on Thursday, in a 6-3 win over Kansas City on Sunday. Happ earned the win, as he went 6 innings, allowing a run on 3 hits and a walk, with 2 strikeouts. This was only the second time in the nine games since the All-Star break that a Yankees starter has gone six-plus innings, with the other instance coming from Masahiro Tanaka, who threw a complete game Tuesday night in Tampa Bay. Happ now has allowed just one run in each of his two starts since the All-Star break (two runs in 11 innings pitched) after permitting at least three runs in each of his final five starts before the break (2-3, 6.84 ERA, 26.1 IP, 25 R/20 ER). 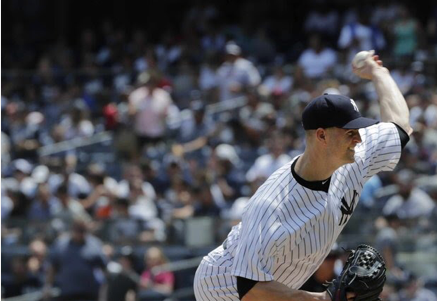 One of those tough outings before the break was on July 7 when the Yankees touched up Happ for 6 runs on 4 hits and 6 walks, with 5 strikeouts, in 2 2/3 innings. Happ dominated, as he had exceptional command, throwing just 96 pitches, including 63 strikes, and shut out the Royals for the first five innings. In the sixth, Kansas City broke against Happ when Salvador Perez hit a solo home run that made it 5-1 Yankees at the time. Throughout his career, Happ has always stepped up after trades. In 35 games, including 31 starts, with his new clubs, he has compiled a 16-8 record with one complete game and a 3.22 ERA (181.2 IP, 150 H, 68 R/65 ER, 66 BB, 178 K, 13 HR). Happ will face a big test in his next start, as he will be pitching for the Yankees on the road at Fenway Park against the first-place Red Sox. The Yankees gave Happ a lead to work with in the bottom of the first when Aaron Hicks hit a two-run home run off the foul pole. After Perez's homer in the sixth, Kansas City got solo shots from Hunter Dozier off Chad Green in the seventh, and then from Russell Herrera off David Robertson in the eighth. Aroldis Chapman came in to pitch the ninth, and earned his 28th save of the season.